The Star Wars­ prequels have had their fair share of criticism over the years. However, despite this, the prequel trilogy does have its moments. While they may not be as entertaining or thought-provoking as the original films, each of the films contain some great scenes and imagery. In fact, there are probably a ton of things you never noticed in the Star Wars prequels (even if you have your own Star Wars fan theories). The best parts of films like The Phantom Menace are not the action sequences, but the little hints that subtly suggest the things to come. The often clumsy dialogue in Attack of the Clonescontains clues about the future of the characters, and Revenge of the Sith has some of the best hidden foreshadowing in Star Wars, with characters used extremely effectively as symbolism. The truth is, there are myriad amazing moments of foreshadowing in the Star Wars prequels, and they’ll make you appreciate those films at least a bit more. The prequel trilogy showed audiences some of Darth Sidious’s other apprentices and trainees, besides Darth Vader. Each of the three movies has a particular focus on a specific antagonist: The Phantom Menace has Darth Maul, Attack of the Clones features Count Dooku, and Revenge of the Sith focuses on General Grievous. These three characters perfectly foreshadowed the man Anakin Skywalker would become as Darth Vader. Darth Maul is a manifestation of evil and hatred, the forces that drive Anakin to the dark side. Meanwhile, Count Dooku is known for his split from the Jedi Order, symbolizing Anakin’s fall from his friends and mentors. The final piece comes with Grievous, who hints at the final melding of man and machine that corrupts Anakin after his battle with Obi-Wan Kenobi. In Attack Of The Clones, we can clearly see that Anakin’s shadow on the wall of the moisture farmhouse is reminiscent of Darth Vader’s striking silhouette (you can check it out in the image above). 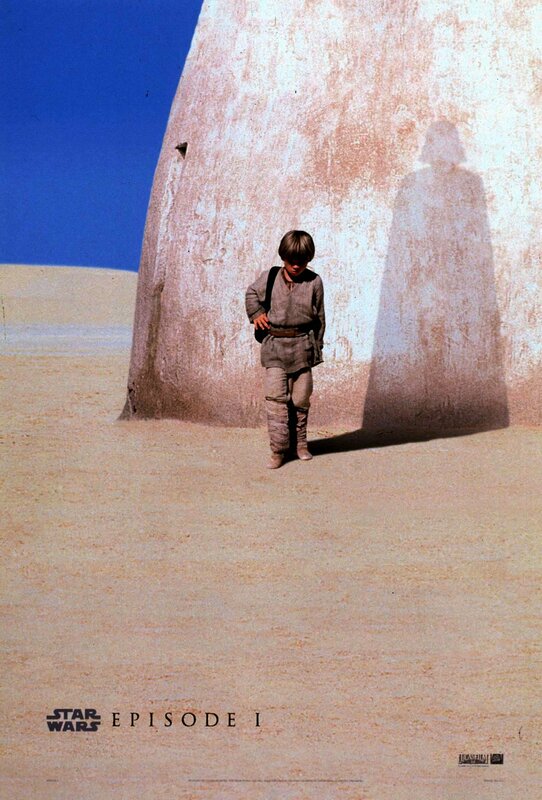 This same method was also used in the promotion of The Phantom Menace, which showed a much younger Anakin casting a long, Vader-esque shadow against the wall of a hut. Later, again in Attack of the Clones, we see Anakin outlined against the dual sunset of Tatooine, and he looks astoundingly similar to Darth Vader. If you have good eyes, and a lightning-fast pause reflex, it’s plain to see that Anakin had Vader living in his shadow for a long time. In the scene pictured above, Anakin and Obi-Wan talk before going their separate ways. Kenobi eventually ends the conversation by saying, “Goodbye, old friend.” This symbolically predicts this exchange will be the last time the two men will meet as friends. Anakin is gone the next time they come together, replaced by Darth Vader. You might have easily missed the visual foreshadowing of Anakin standing in the dark shadows, while his mentor is bathed in bright light, a representation of their respective paths. Reddit user childplease7 suggests the obsession Anakin Skywalker shows in creating machines and tinkering with technology prophesies his future. His feeling of comfort around droids, as opposed to living creatures, shows a lack of empathy that eventually leads to the young boy becoming Darth Vader. It also predicts his dramatic transformation into a being that’s more machine than man, as he becomes the very thing he has the greatest affinity for. The beginning of Revenge of the Sith perfectly foreshadows the events in Return of the Jedi. In the prequel film, Anakin kills Count Dooku at the insistence of Palpatine, signaling his willingness to turn to the dark side. This mimics the choice Luke must face onboard the Death Star, when he has the opportunity to strike down his father in similar circumstances. While it prefaces the same decision Luke would make decades later, it also highlights the differences between father and son. Anakin is willing to give in to anger and kill the Sith Lord, while Luke manages to resist the urge to kill Darth Vader, ruining the Emperor’s plans. Those who saw the original Star Wars trilogy before watching Revenge of the Sith were aware that Luke Skywalker was an important person. However, a rather subtle image at the end of the the third movie hinted at this fact as well. The scene is almost exactly the same as the sunset we see in A New Hope ,when Luke is staring at the horizon and Tatooine’s two suns. The only difference here is that it is a sunrise instead of a sunset, pointing towards a fresh dawn, where Luke is the new hope the galaxy needs. We can see this very clearly when Lucas has Qui-Gon and Obi-Wan basically act out the same missionin Phantom Menace that C-3PO and R2D2 undertake in Return of the Jedi. In Menace, Qui-Gon and Obi-Wan are tasked with negotiating with the Trade Federation to end the conflict between them and the Naboo. Similarly, at the beginning of Return of the Jedi, C-3PO and R2D2 are sent to negotiate with Jabba to end the conflict between Jabba and Han Solo. Both narratives feature teams entering visually similar chambers, have mysteriously hooded characters, and even see characters say the exact same line: “I have a bad feeling about this.” If you see the beginning of Phantom Menace, you’ve basically seen the beginning of Return of the Jedi. Although their relationship appears to start romantically, there is some deep foreboding in Attack of the Clones that suggests Anakin and Padme might not live happily ever after. In contrast to the colorful and vibrant imagery displayed while the couple are outside on Naboo, the visuals becomes much darker as their relationship becomes serious. It culminates in the very rooms they occupy. They drastically reduce in size, creating a claustrophobic atmosphere. Padme even begins to wear darker clothes and a choker around her neck, hinting the pair of lovers will experience conflict, and Anakin will eventually choke Padme with the Force. The main reason Anakin fell to the dark side was his fear of loss. He was overcome with rage at the death of his mother, and the imminent loss of Padme drove him to become Palpatine’s student. He turned to Sith teachings to learn how to control the world, and stop his loved ones from dying. It is especially important to realize that he failed to free his mother and save her life after she was kidnapped. This need for control is shown from Anakin’s very first scenes, when, as a child, we see him working on machines and technology that he can command. His obsession with creating new machines echoes his need to govern other aspects of life, although later it’s much more severe. It is entirely plausible Qui-Gon Jinn’s witty one liner, “There’s always a bigger fish,” may have had some deeper meaning to it (other than its immediate, fish-based relevancy). However, the idea doesn’t just apply to the gigantic aquatic creature the protagonists encounter on Naboo, but rather to the entire story as a whole. It foreshadows everything that happens over the course of the prequel trilogy, from finding Anakin – a boy with more innate power in the Force than anyone else – to learning that Darth Maul is just the lesser of two Sith Lords and his death is only the beginning of the upcoming struggle. There’s always a bigger fish. Obi-Wan Kebobi’s entire fight with General Grievous is a symbolic nod towards his future battle with his former friend and apprentice, Darth Vader. The obvious take here is that Grievous is an aggregate of Darth Vader, since both are a cross between human and machine. However, there is another, more subtle piece of imagery that lets us know what’s about to come. The experienced Jedi spends much of the time before the fight hiding in the shadows, in parallel with his eventual exile on Tatooine where he must hide from his enemies. It’s also important to note that Grievous mirrors Anakin in another way. Both fail to understand the true power of the Force. Grievous thinks that being trained to use a lightsaber makes him the same as a Jedi, while Anakin fails to understand that the central tenant of the Force is accepting the natural order of life and death — which fuels his ultimate fear of loss and drives him to the dark side. The color of the lightsaber a Jedi uses has always had some significance in the world of Star Wars. Blue is often associated with apprentices and less experienced Jedi, while green tends to signify someone is mature and considered a master of their art. We see this with Luke in the original trilogy, as he ends up using the green lightsaber toward the end, just like Yoda and Qui-Gon Jinn. Using this concept, George Lucas seems to have planted a tiny piece of foreshadowing about how powerful Anakin is, and the young Jedi’s feeling of superiority. When he and Obi-Wan are on Geonosis, they are given new lightsabers by the arriving Jedi reinforcements. Obi-Wan gets his usual blue, but Anakin ends up with a green one. This could have a deeper significance, with the choice of color implying Anakin feels he has surpassed his teacher, and wants to go out on his own.